You would never dream of inviting guests to your house without making certain preparations, so don’t invite potential buyers without first making the necessary updates by preparing your home to sell. If you are like most sellers, you want to get as much as possible for your home and you want to do it as quickly as possible. After you’ve lived in a house, it becomes much more than four walls and a ceiling. It’s a home and it has a lot of good memories. Your first step to preparing your home to sell is to realize that you will take these memories with you wherever you go, but you won’t be taking the house. It can be difficult to let go, but the task will be much easier if you start to think of it as a new beginning rather than an ending. An important part of getting your home ready to sell is in staging the decor for potential buyers. When you stage a home, you create an environment that is free of any personal items, such as photos and/or anything that stands out as being customized for you or your family. When a potential buyer walks through your home, they need to envision their belongings and decor without being distracted by yours. While these items may be special to you, they could possibly prevent the buyer from being able to imagine their own style complimenting the home. In addition to removing any personal items, make sure that you remove any clutter from the home. A clean home seems larger and more inviting, whereas a lot of stuff lying around could give the impression that the home is too small or cramped for storage. Pack up any knickknacks, remove your children’s drawings from the refrigerator and clean up your counter space in both the kitchen and bathrooms. Now that your house is clean, it’s time to put the finishing touches on the staging process. A solid, neutral shade in a tablecloth should be selected for the dining room table. Depending on your decor and wall coloring, a solid white, sand or ivory covering will work well. In the center of the table, a vase with fresh cut flowers (or silk, if you have allergies) will add a nice accent. Did you know that the kitchen and bathroom are two of the main selling points to any home? Keep this in mind when preparing your home for potential buyers. The living room should have one focal point, whether it be a fireplace or breathtaking view of the outside world. If you have too many features screaming out at potential buyers, they may feel overwhelmed, so focus on one aspect and make it shine. If you have a mantle, line it with three candles that match your decor in color. Place a large candle in the center with one smaller one on each end, which will be reminiscent of a perfectly matched bookend set. A home with a stunning view should have window dressings that accent the positive, instead of hiding it. If your furniture has a design of any kind, mask it with a solid slipcover to compliment the flooring or wall color. Some homeowners also add a fresh coat of paint to their home, which will bring life back into a fading color. Turn on the lights and open the blinds and draperies to create a bright and inviting environment throughout your home. Now that you know how important it is to remove any clutter and oversized or bulky furniture, you need to know where to put it. If you already have a new home, you can simply move it there. Otherwise, you can put it into storage until you are ready to move. It’s important to leave some essentials in your former home for potential buyers to see, such as a dining room table, a sofa and chairs, bed, etc. 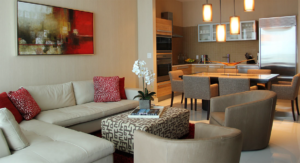 Any additional furnishings that seem to interrupt the flow of your home, or make it feel cramped, should be removed. You do not want potential buyers to feel as though the house is too small. Details, Details, Details . . .
As a final strategy to prepare your home to sell, make sure that you have any carpet stains removed, windows cleaned and fresh linens placed in the bedrooms and bathrooms, etc. You would be surprised how many people pay attention to even the smallest of details, so be sure to fix any small repairs that could be a turnoff for buyers. Last but not least, make sure your home looks just as good on the outside as it does on the inside. This means that your lawn should be cared for, flower beds must be maintained and any outdoor clutter must be removed.